BEVA® Artist Gesso-p | Beva®-Products | Glues | Mediums, Binders & Glues | Kremer Pigments Inc.
Beva® Artist Gesso is highly elastic putty capable of following the movements of the substrate, thus solving an age old problem. Combining a compressible, inert mineral power, oxidation inhibitors, UV stabilizers, a buffer to remain a non-acidic pH and BEVA® resins, Beva® Artist Gesso is a stable gesso, yet reversible with heat or with mild hydrocarbons solvents. 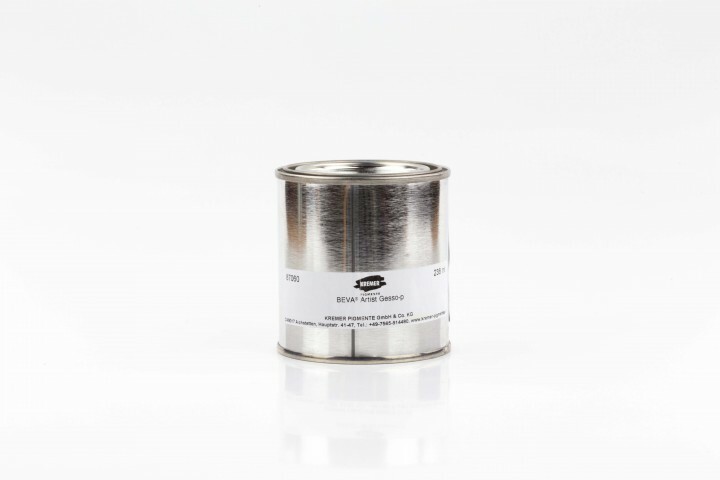 Beva® Artist Gesso adheres to wood, plastics, metals, paint, etc. It may be tinted with dry pigments. Smooth and flexible, it can be shaped or textured (dries white). Beva® Artist Gesso works with all media (oil, alcohol, or aqueous) and can be burnished and gilded. Customer evaluation for "BEVA® Artist Gesso-p"